In the late 16th century, tobacco was introduced from Portugal and people started to grow it throughout Japan. Since they needed many knives for cutting tobacco leaves, "tobacco knives" were first produced in Sakai. For its sharpness, they were given a special hallmark called "Sakai-Kiwame" by the Edo feudal government, and spread as monopoly goods in Japan. 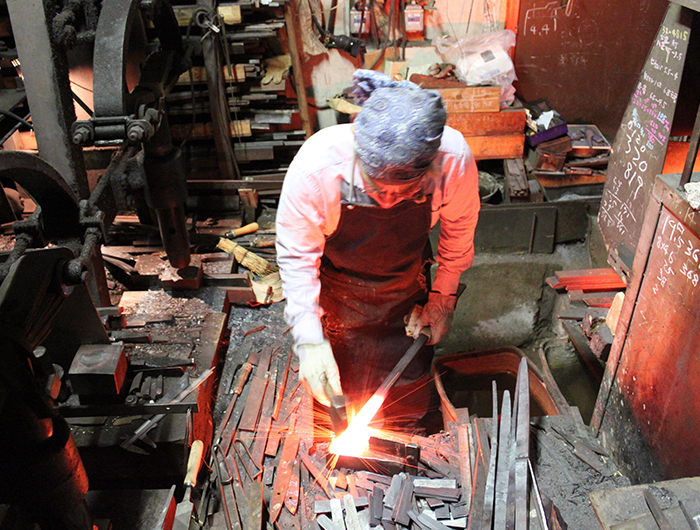 Sakai knives are carefully made one by one. They have received good reviews from many professional chefs and now it's said most of the knives they use are from Sakai. According to the desires of users, the knives are finished by adjusting thickness and length in millimeters. This can be done only by professional craftsmen who know knives well and have great intuition in ascertaining the state of knives. The experienced techniques of professionals has made a contribution to the development of Japanese food culture. There are roughly two kinds of knives; the single-edged "Japanese knife" and the double-edged "Western knife". Generally, double-edged Western knives that are made from stainless steel are used at home. They feature even surfaces which enable you to cut symmetrically even if you make a straight cut from above. Stainless steel knives are widely used around the world because they are resistant to rust, and have various uses like Santoku knives. On the other hand, single-edged Japanese knives have two sides, and steel has been attached. Steel blades are hard and sharp, so they are perfect for when you cut soft foods such as fish and meat. Since they can cut beautifully and foods hardly stick to the edge, professional chefs like Japanese Itamae tend to use single-edged Japanese knives. With their high sharpness, you can perform a completely different cutting method with Sakai knives - draw-cutting. When you use one, put the blade on the food, and cut by drawing the knife towards yourself. Also, it requires less effort when cutting. The single-edged knife has one curved side which makes food difficult to stick. The reason why Sakai knives have been become popular among professional Japanese chefs who do cutting work for many hours is the beautiful appearance they create. It even seems to make food taste even better. Also, it doesn't require much physical power to cut, the ingredients hardly stick to the knife so you can use it for a long time without getting tired, and you're less likely to get injured because you can cut lightly. However, the knives need regular maintenance (with a sharpening stone, for approx. 5 minutes) in order to keep good sharpness.